If you are looking for activities that will help teach your students about triple consonant blends than this is the product for you. 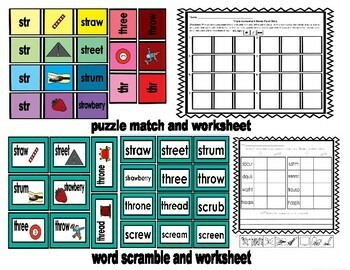 ***There are 3 different types of worksheets. 2nd worksheet: students read the sentence and fill in the blank with the words below. 3rd worksheet: each worksheet covers a triple consonant blend. Print off one of the blends and hand it to each student. Place words around the room and have students find the specific blend that is on the worksheet. Have students write words into each paint bucket until everyone of them is full. 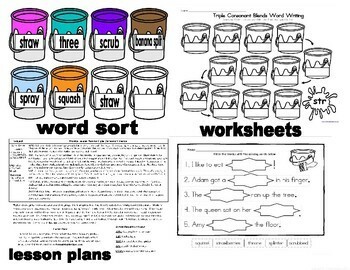 ***This activity comes with 2 worksheets. 1st worksheet: students place words around the room and write the words under the correct category. 2nd worksheet: students will find a triple-consonant blend and write it in one of the paint chips. In the box, next to the blend, students will draw a picture of a word that starts with that blend. In the last box, students will sound out the picture and write the word in the last box. Students will continue to do this until all of the paint chips have been filled. - Students sort the word cards with its picture by triple consonant blend. Then unscramble words on the scrambled word card. The answer is on the back of each card. ***There are 2 different types of worksheets. 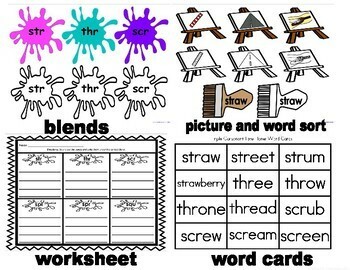 2nd worksheet: Students unscramble words, cut out pictures to glue next to the words, and then write the correct spelling next to the picture. At the bottom of the worksheet, students will pick one word to write a sentence about it. -I made a card for every triple consonant blend word used in this activity. You can either send the cards home or create games using the cards like Memory or Go Fish. -I created lesson plans that could be used for this literacy activity. Lesson Plans come with common core state standards and ideas on how to use each activity. -The reading practice letter has words that go with the skill of the week. It gives parents suggestions how to make reading the words fun. -The home activity letter has students find a picture that covers the skill for the week and glue on the back of it. Students can use magazines, online pictures, or draw their own picture. Students bring back the letter and sort the pictures by the skill of the week. -This tests the skill for the week. There are two parts to the assessment. In the first part, students read words. In the second part, students apply the words into sentences. On the teacher copy, circle the words that students get correct. When students are reading sentences, check for the skill words for the week and circle the words they read correctly. If students get 10/12 right then they have mastered the skill. 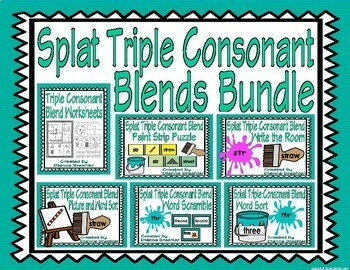 - I wrote down videos, activities, and books that cover triple consonant blends. Here is an example on how to use this activity: I play several games with word cards as a whole group. The main games that I play that my students love is mingle and 2 circle game. Mingle is where you give each student a card. You start the game by saying “mingle”. Students will walk around the room until you say stop. When you say stop, students are to find the closest person to them to partner up with. They read their card to them and then switch cards. I repeat this game until students lose interest. The 2 circle game is where I have students get into 2 circles (an inner and outer circle). When they get into their circle they make sure that they have a partner that faces them. Students read their card to their partner and switch cards. Then I have the inner circle move to the right one time. Continue to do this until students have made a complete circle. You can also give each student a picture or a word card. Then have them find its match.